Guayaquil is the picturesque economic capital of Ecuador. With just under 2.7 million residents, it is the largest and one of the most bustling cities in the country. Guayaquil offers its visitors a rich tropical Caribbean personality and beautiful views of River Guayas. Popular tourist attractions include Malecon 2000, Las Penas and Santa Anna’s Hill. 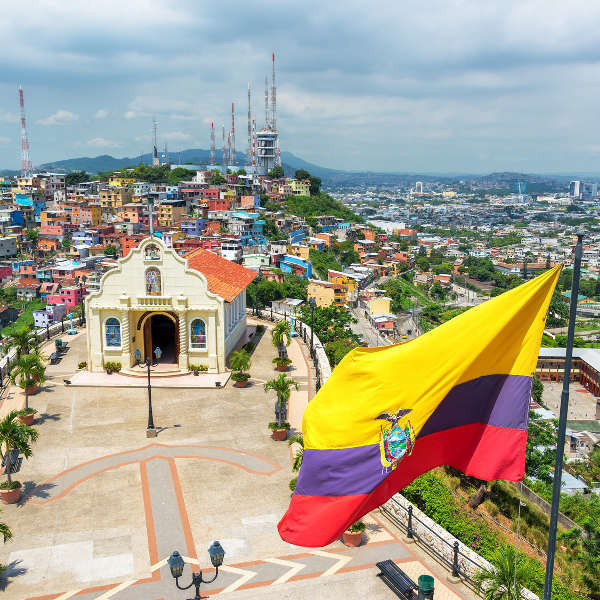 Cheap flights to Guayaquil are now available for a limited period of time, so get ready to enjoy this pulsating heart of Ecuador! Guayaquil is home to José Joaquín de Olmedo International Airport (GYE), which is located on scenic 17-minute drive from the city centre. 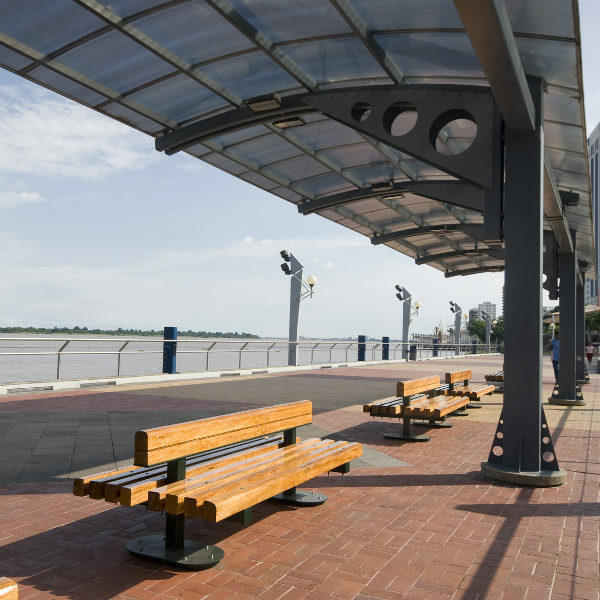 Take your time wandering along the Malecon 2000, alongside the River Guayas. There are cafés, gardens and other hidden gems along the way. Tread up 500 steps to the Las Penas peak, for the most beautiful views of the city. Take a little break at a café en route and enjoy the scenery. Head over to Seminaro Park, in the downtown region, and feed some of these unlikely friendly beasts. They especially enjoy pieces of fruit, lettuce and bites of bread. The location of Guayaquil allows for beautiful weather all year round. There is, however, a rainy season that is regarded as the off-peak season. During this time (January to April) it is damp and there is a lot of fog in the air. Peak tourist season falls over summer (December to February) and winter (June to August), as this is when most people take leave and therefore travel. If you wish to skip the crowds and expensive costs of flights and accommodation, consider booking your trip to Guayaquil over spring (March to May) or autumn (September to November). There are no ridiculously trendy cafés or lounges to speak of in Guayaquil, but the streets of the city make up for it with uniquely Ecuadorian sites and experiences. 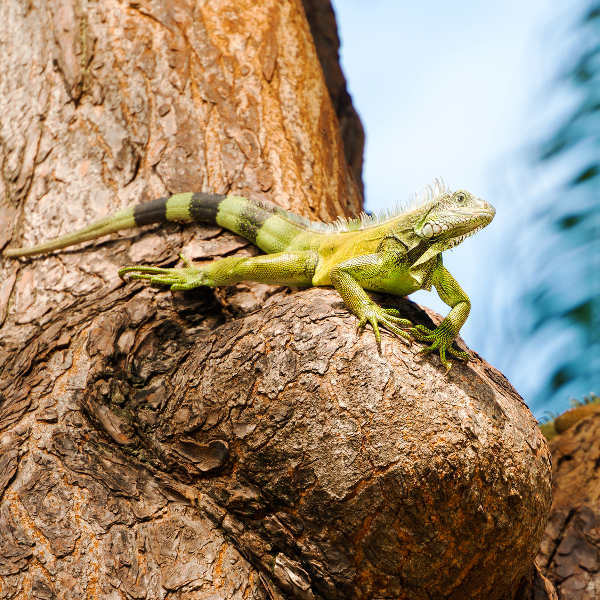 Ever thought of enjoying an afternoon amidst more than 100 iguanas? The Seminano Park in the heart of the city invites visitors to get to know these gentle giants with offers of crunchy vegetables and the reptiles’ favoured treat – white bread. Later, take a trip to Las Penas and find your way up the 500 steps to the top. Once there, you’ll be gifted with the most astounding views of the city below, so make sure to take your camera with you. And then of course, the most well-loved pass-time for locals and visitors alike – a walk along Malecon 2000. Take in the sights of the River Guayas while stopping frequently at cafés, curios kiosks and even a small shopping mall. Compare several airlines and book your cheap flights to Guayaquil online with Travelstart! Guayaquil is an up and coming city with lots of beautiful attractions that are worth visiting. The city is fairly safe, but it is not recommended to venture off into areas that are not familiar. Stick with a tour guide, and as always, keep your valuables and cash out of sight. It is always important to have your vaccines up to date when you are travelling. When visiting Ecuador, it is recommended to get a vaccination for hepatitis A, as you will most likely be eating food that is unfamiliar. You should get a shot for typhoid if you’ll be doing any trips to smaller, more rural areas of the country. Other vaccines that are recommended are hepatitis B, yellow fever, malaria and rabies.